We have talked about Browser and Web security several times on this site, but it is important to remember that the bad guys do not sit still. They are very aggressive in their attempts to invade your privacy and security. In a recent article, I compared several browsers on their perceived ability to keep you safe. It is important to know that each of the major browsers, Chrome, Edge, and Firefox continue to battle for our online safety because browsers are the pathway hackers use to infect you. Combined with your Operating System, they are also your first line of defense against hacks. In two recent reports published by NSSLabs concerning Web Browser Security, ”Protection Against Phishing”, “Protections against Socially Engineered Malware (SEM)”, a comparative report on each browser’s ability to protect us against Phishing, and SEM, highlights the importance of using a secure browser and the security features inherent in your operating system. Microsoft continues to improve their Edge browser’s security and according to the NSSLabs Findings, Edge performed the best in protection against phishing attacks, blocking an average of 96.7% of phishing URLs. It also had the highest zero-hour protection with a rating of 86.5%. Firefox came in second with 94.3%, while Google sat right at 94%. Zero-hour, also known as Zero Day attacks, take advantage of our computer’s defenses when not having a signature solution. Zero-hour attacks may indeed be undetected for much longer than a day, so any advantage your browser can provide may be the difference between a protected or hacked system. The Safe Browsing APIs used in Chrome, Safari, and Firefox provided additional, but minimal phishing protections over time with Firefox slightly ahead of Chrome short term. Microsoft Edge’s SmartScreen provided enhanced protection that complemented their Edge browser. 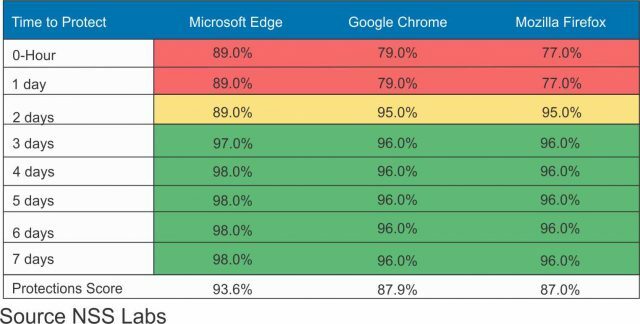 While Microsoft Edge appears to have the current lead in browser protections, that does not mean it always will. That is why I can never stress enough the importance of safe browsing and these reports are valuable tools in keeping us knowledgeable. There is considerably more information contained in the reports and I would encourage you to visit NSS Labs Research Library to review the reports in their entirety. My interest in computers was a natural transition from all things electronics. I was hooked after building my first Heathkit computer around 1976, which evolved into a TSR80 and a long list of Windows computers. My first full blown program was a graphics program which started my career path in graphic design and IT work for 40 years. I now run a small computer repair and service company focused on helping veterans and retirees in our area with computer and software training classes. Jim, do extensions offer additional protection, and/or others products (like AdGuard, and Ghostery)? If so, this might improve the results, Mindblower! Yes, they do MB. They also speed up the browser because you do not have to load the image. Anything you do not have to download to your computer reduces your infection rate by downloads and drive-bys. Some, however, fail to give the option of accepting ads from favorite websites like DCT. Love this site for all the useful information it provides. Have used it for the last 5 or 6 years. Thanks for everything you provide for old farts like me who struggle to keep up with modern technology.